This is 26 yo male. Smoker. Suffered a grade IIIA open fracture of his left humerus (13-C2.23) and olecranon (21-B1.31) 3 weeks ago. Extensive debridment was performed, a big piece of the radial column was lacking but the articular surface was only in 2 pieces. A decision of immediate osteosynthesys was done. Primary skin closure was acomplished but it was clear that some skin was lacking too. The ulnar nerve was surprisingly intact, no deficit after surgery. Now he has a nice wound, no septic signs, elbow motion is 5-100 because the skin becomes very tight and full pronosupination. 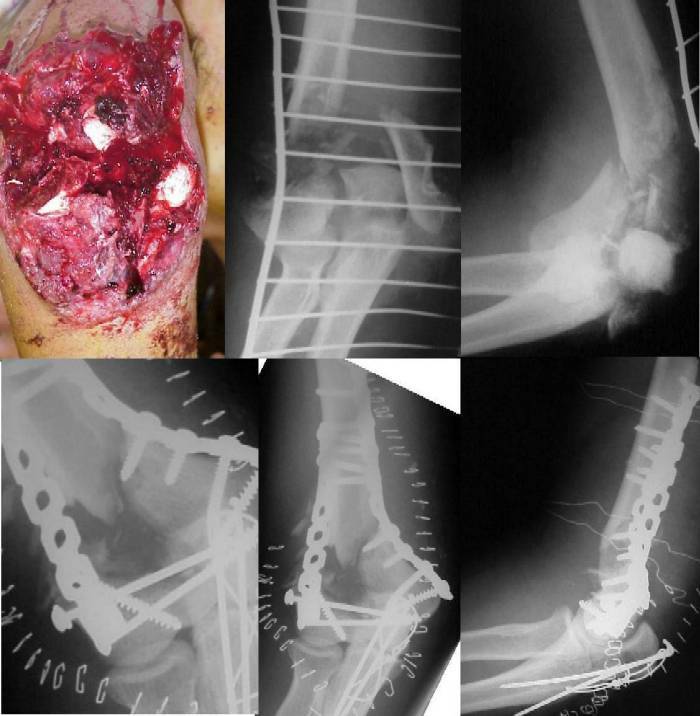 What are your thoughts, should I bone-graft his radial columnnow or wait to see what happens? Hospital Universitari Dr. Josep Trueta. I think its possible, but unlikely he will heal on his own if a segmental defect is present. Sometimes they form abundant heterotopic ossification, and it heals in that manner. As of late, I have been using antibiotic laden boneoplast (Ca SO4) at the time of open fracture closure, and some have formed nice bone. Assuming no healing, I would harvest some iliac crest, and bone graft in the next 4 weeks or so. When you go back in, you can check the integrity of the fixation.